Description: Band Walking is a great exercise for stabilizing the hip and knee joints. Not only does it improve lower body stability, but it helps to strengthen your hip abductors and glutes which are a huge muscle involved in the golf swing. 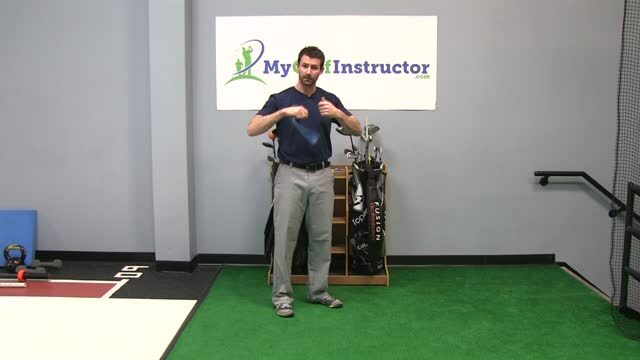 Strengthening and stabilizing all the muscles around the pelvis goes a long way in assisting the pivoting action of your swing. Start by choosing a resistance band that is the best strength to challenge your muscles, but yet still allow you to get a good range of motion. You can select a band that simply wraps around the lower part of your legs near your ankles or you can use an exercise band with stirrups. In this case stand on the band with the middle of your feet. Then pull the stirrups up and criss cross them switching hands. Set up with your toes pointed forward and in a half squat position. Try to keep your feet in line with your shoulders and your balance in the middle of your feet. Simply take a big step laterally to one side and then step the feet together. Continue going across the room and then come back stepping with the other leg first. Strive for 3 sets of 8-10 steps on each side. Once you feel comfortable after a week or so, try a more resistant band and keep working your way up. You may also increase reps as you gain strength.